For the first time, Copts in Egypt are venting their anger in full force by protesting in the streets of Cairo since Sunday morning. Friday night's explosion outside Saints Church in Alexandria during New Year's midnight mass killed 21 and left more than 96 injured and stirred Copts out of their docile "pigeon attitude." 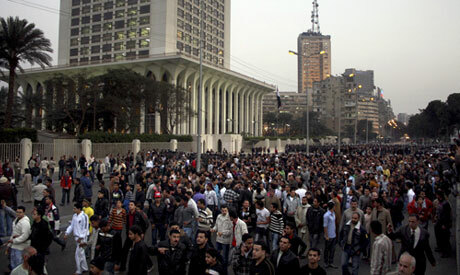 Throughout the day, there have outbreaks of protests and violent demonstrations by angry Copts on the streets of Cairo. Hundreds of Copts demonstrated in front of Nile Towers mall on Kornish el-Nil chanting "With our souls and blood we save the cross." They marched to the Radio and TV headquarters at Maspero, where some protestors tried to storm the building but were prevented by the police. As the protestors moved along the river towards Imbaba they clashed with security personnel, with reports of rocks being thrown by both groups. Moreover, around 50 Copts demonstrated in front of the Coptic Cathedral asking for a peaceful life, recognition and fairness. They addressed President Hosni Mubarak with chants of "the blood of the Copt is not cheap." The latter demonstration started early in the morning as the head of Al-Azhar, Ahmed El-Tayeb, Grand Mufti Ali Gomaa and Osaman Mohamed Osaman, Minster of Planning and Economic Development came to pay their respect to Coptic Pope Shenouda III. Angry protestors threw stones at the three figures as they didn't want to receive condelences from muslim figures. A few hours ago, 4,000 Coptic garbage collectors have gone on a violent strike on the Autostrad highway, throwing stones and empty bottles on the street demonstrating against the explosive incident. The demonstrators have called for firing Abdel Rehim el-Ghol, member of parliament for Nagaa Hamadi, because of the bloody attack that took place on Orthodox Christmas on 7 January last year. Police intervened to stop the demonstration and clashes took place between both until the demonstration ended. A limited number of Copts have also gone out on to Salah Salem Street chanting in anger against the Coptic Egyptians' loss and sectarian violence in Egypt. Many other protests are yet expected. Human rights activists and bloggers are organizing a silent stand along the Kornish of Cairo on Friday afternoon according to Gamal Eid, head of the Arabic Network for Human Rights Information. Similar demonstrations were witnessed in Alexandria and Assiout. I highly doubt that demonstrators were throwing stones to pope Shenouda as well.